In this study, azo dyes containing an imine group were synthesised by coupling p-hydroxybenzylidene aniline with the diazonium salts of p-toluidine, 4-aminophenol, aniline, p-chloroaniline, p-fluoroaniline and p-nitroaniline. The compounds were characterised by melting point, elemental, UV-Vis and IR analyses as well as 1H-NMR and 13C-NMR spectroscopies. Moreover, the experimental data were supplemented with density functional theory (DFT) calculations. The experimental data on FT-IR and UV–Vis spectra of the compounds were compared with theoretical results. The DFT calculations were performed to obtain the ground state geometries of the compounds using the B3LYP hybrid functional level with 6-311++g(2d,2p) basis set. Frontier molecular orbital energies, band gap energies and some chemical reactivity parameters, such as chemical hardness and electronegativity, were calculated and compared with experimental values. A significant correlation was observed between the dipole moment and polarities of the solvents and the absorption wavelength of the compounds. Umape P.G, Patil V.S, Padalkar V.S, Phatangare K.R, Gupta V.D, Thate A.B, Sekar N, Synthesis and characterization of novel yellow azo dyes from 2-morpholin-4-yl-1,3-thiazol-(5H)-one and study of their azo-hydrazone tautomerism. Dyes and Pigments. 2013;99: 291-298. 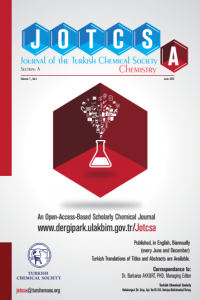 Gür M., Kocaokutgen H., M. Taş, Synthesis, spectral and thermal characterissation of some azo-ester derivatives containing a 4-acryloyloxy group, Dyes and Pigments, 2007, 72, 101-108. Purtas F, Sayin K, Ceyhan G, Kose M, Kurtoglu M, New fluorescent azo-Schiff base Cu(II) and Zn(II) metal chelates; spectral, structural, electrochemical, photoluminescence and computational studies. Journal of Molecular Structure. 2017; 1137: 461-475. Atay Ç.K, Gökalp M, Kart S.Ö, Tilki T, Mono azo dyes derived from 5-nitroanthranilic acid: Synthesis, absorption properties and DFT calculations. Journal of Molecular Structure. 2017; 1141: 237-244. Sreenath M.C, Mathew S, Joe H.I, Rastogi V.K, Z-scan measurements of the third-order optical nonlinearities and vibrational spectral studies by DFT computations on azo dye 1-(2-Methylphenylazo)-2-napthol. Optics and Laser Technology. 2017; 97: 390–399. Kohn W, Sham L.J, Self-consistent equations including exchange and correlation effects. Phys. Rev. 1965; 140: A1133. Gaussian 09, Revision B.01, Frisch M. J, Trucks G. W, Schlegel H. B, Scuseria G. E, Robb M. A, Cheeseman J. R, Scalmani G., Barone V, Mennucci B, Petersson G. A, Nakatsuji H, Caricato M, Li X, Hratchian H. P, Izmaylov A. F, Bloino J, Zheng G, Sonnenberg J. L, Hada M, Ehara M, Toyota K, Fukuda R, Hasegawa J, Ishida M, Nakajima T, Honda Y, Kitao O, Nakai H, Vreven T, Montgomery J. A, Peralta J. E, Ogliaro F, Bearpark M, Heyd J. J, Brothers E, Kudin K. N, Staroverov V. N, Keith T, Kobayashi R, Normand J, Raghavachari K, Rendell A, Burant J. C, Iyengar S. S, Tomasi J, Cossi M, Rega N, Millam J. M, Klene M, Knox J. E, Cross J. B, Bakken V, Adamo C, Jaramillo J, Gomperts R, Stratmann R. E, Yazyev O, Austin A. J, Cammi R, Pomelli C, Ochterski J. W, Martin R. L, Morokuma K, Zakrzewski V. G, Voth G. A, Salvador P, Dannenberg J. J, Dapprich S, Daniels A. D, Farkas O, Foresman J. B, Ortiz J. V, Cioslowski J, Fox D. J, Gaussian, Inc., Wallingford CT, 2010. Becke AD, A new mixing of HartreeeFock and local density-functional theories. J Chem Phys. 1993; 98:1372-7. Lee C, Yang W, Parr RG. Development of the Colle-Salvetti correlation-energy formula into a functional of the electron density. Phys Rev B 1988; 37: 785-9. Cossi M, Barone V, Cammi R, Tomasi J., Ab initio study of solvated molecules: a new implementation of the polarizable continuum model, Chem. Phys. Lett. 1996;255: 327-335.